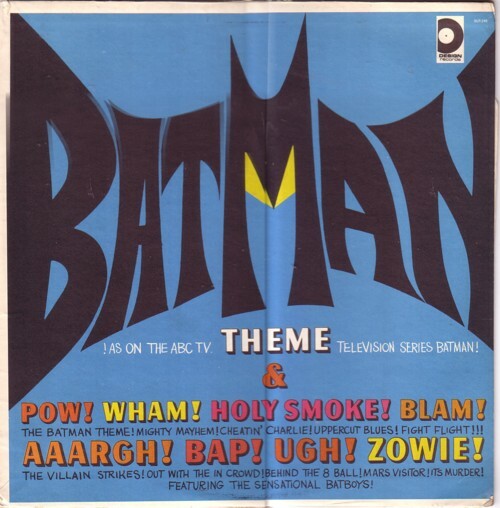 If this is going to be a true Soundtrack of my life, there has to be put more Batman in it then I did so far. 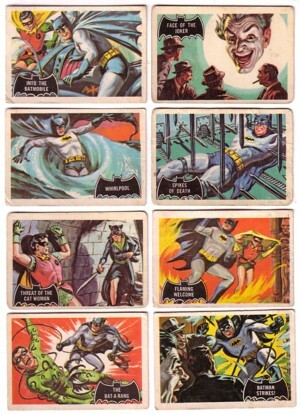 My dearest Batman memories are the first series of bubblegum cards. The excitement of buying them, the taste of the chewing gum, the feeling of the pile of cards in my pocket when I walked to school, the cool drawings, the riddles on the back of the cards, it are memories that I probably share with millions of people my age. I cannot remember much of the television series, apart from what I have seen much later. But I do remember the comics: I must have read these dozens of times. I don’t have them anymore now; I decollect just as much as I collect. Batman records came much later in my life. And most of the Batman music and audio that I have is on CD or tape. There is a lot, but the original stuff is not easy to find. One of my best finds is an LP by the Bat Boys, released on Design Records. A real rip off record, with only a version of the theme song to live up to the promises on the sleeve. The other nine (instrumental) songs could have been from any movie; there is little to no ZAP or POW in them. But in case you don’t belief me on my word, here is one of the songs: Behind the 8 ball. And here is a video from a youth that I never had!